ROTHESAY (AUS) (Bay 2006-Stud 2011). 4 wins-1 at 2, Queensland Guineas, Gr.2. Out of a half-sister to SW Causeway Lass. Sire of 87 rnrs, 36 wnrs, inc. SP In His Stride and of Jacksay - Fionesay (H.K. ), Oberland, Shadow Lawn, Shotacross the Bow, Too Good to Refuse, Extrasay, Hello Paris, Rock de France, Rosewood Hill, Says Me, Spiritos, Fogoso, Havasay, Honey Ko, Legal Procedure, Supersay, Sayrothy, Bannatyne, Emeth, etc. His oldest progeny are 3YOs. ROSE OF LONHRO, by Lonhro. Placed in Aust. This is her first foal. Hinterland. 3 wins at 1400m, 1700m in Aust. Rose of Lonhro. See above. Candente. 5 wins to 1200m to 2014-15, BRC Gallopers Sports Club P., 2d BRC Brc.com.au P., 3d BRC Mater Dei School H., Yellowglen H.
Marseillaise. 9 wins from 1100m to 2200m, A$197,907, Broome Cup, Alice Springs TC Northern Territory Guineas. Miss Razyana. 4 wins to 1400m in Canada and Aust, STC Jacob's Creek & Wild Oats Wines H., Stardex Insurance Group H. Producer. Falconten. 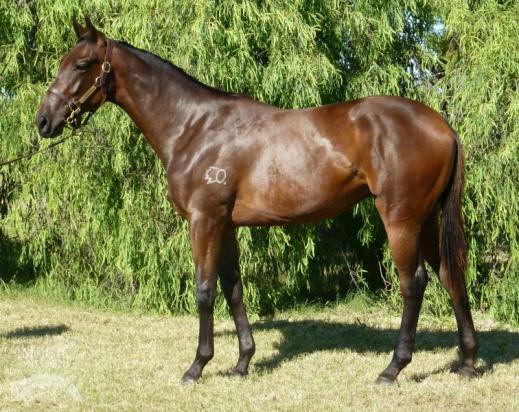 4 wins-1 at 2-at 1100m, 1200m, A$124,600, BRC Ormiston College H., QTC XXXX Gold H., 2d BTC Christmas Cheers H., 3d BRC All Hallow's H., Lyndhurst Stud H., Qld Tatt's RC Carlton Draught H.
Maltese Grey. 16 wins-4 at 2-to 1400m, A$150,000, BATC Probus Toondah Welter H., QTC Functions & Catering Welter H., JHS Barnes H., 1st Division H., Bounding Away H., 2d QTC Snippets H., 3d QTC Vo Rogue Welter H., BATC Pandour H., Bernborough Club Quality H., QTC Makata H., 4th Clarence River JC Ramornie H., L.
HARD TO CATCH (Dodge). 13 wins-1 at 2-from 1200m to 1600m, A$1,177,600, BTC Sprint H., Gr.3, QTC Bribie H., L, GCTC Prime Minister's Cup, L, SCTC Glasshouse H., L, BTC Big Dog Racing Supplements H., Zupps Holden H., QTC Red Bull H., 2d QTC Stradbroke H., Gr.1, BTC Summer S., Gr.3, GCTC Goldmarket H., L, Prime Minister's Cup, L, Toowoomba TC Weetwood H., L, 3d BTC Sprint H., Gr.3, BTC Doomben S., L, Qld Tatt's RC Members' Cup, L, Tattersall's Open Mile, L, QTC Brisbane H., L.
Little Stranger (Dodge). 8 wins from 1050m to 1650m, A$319,800, BRC CE Risk Safety Security H., BTC Lyndhurst Stud H., Sunshine Coast Mid 91 H., SITA H., QTC Move Closer P., 2d BRC Tails S., L, Toowoomba Cup, L, BTC Lincom Group H., QTC Marwood Comm Furniture H., BTC XXXX Gold P., Qld Tatt's RC Sky Channel H., 3d BRC Premier's Cup, Gr.3, Qld Tatt's RC Tattersall's Cup, Gr.3, BRC Markers Mark H., Men of League & Optus H.